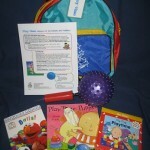 We have created a new line of Literacy Kits for infants and toddlers, from birth to age three. Each Literacy Kit comes in the same colorful backpack as our Pre-K to Fifth Grade kits. 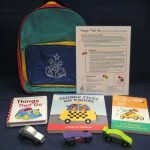 They are written around specific themes and each contains three board books, one or two manipulatives, and a guide (front and back) with reading tips, parenting tips, suggestions on how to use the included manipulatives, and other suggestions. $40.00 each.